On Friday night the regular season ended for area football teams. In a game heard on Mix 107.7, the North Lamar Panthers fell to Melissa 50–35. In the game, Junior Quarterback Kobey Emeyabbi finished with 275 rushing yards and five touchdowns. Honey Grove outlasted Rivercrest 20–19. Prairiland lost their season finale to Whitewright 54–18. Clarksville blanked Mt Enterprise 46–0. It was Cooper squeaking out a win over Bells 34–33. Chisum fell to Blue Ridge 14–12 and Detroit lost to Maud 35–28. Mt Pleasant lost to Nacogdoches 56-27, Mt Vernon shut out New Boston 28-0, Sulphur Springs fell to North Forney 39-24, Daingerfield rolled New Diana 58-7, Paul Pewitt blanked Queen City 43-0, Pittsburg dominated Spring Hill 41-20, Gilmer fell to Liberty-Eylau 54-42 and Honey Grove edged Rivercrest 20-19. Here is the week one playoff schedule: Mt Vernon vs Tatum at Gilmer, Thursday 7:00 pm, on K-Lake 97.7. Pittsburg vs Dallas Roosevelt at Greenville, Thursday 7:00 pm, on Star 96.9. Hughes Springs vs Gladewater at Hallsville, Friday 7:30 pm, on Star 96.9. Paul Pewitt vs Newton at Carthage, Friday at 7:30 pm, on K-Lake 97.7. Daingerfield vs Anderson-Shiro at Athens, Thursday 7:30 pm. On Thursday night, Clarksville will play Tioga at Prairiland stadium at 7:00 pm. Detroit will matchup with Cumby in Mt. Pleasant at 7:00 pm. Honey Grove and Valley View will square off at 7:30 pm in Denison. While Rivercrest will face Celeste in Melissa. On Friday night, Paris will take on Dallas Carter in Denison at 7:30 pm. That game will be on 101.9 KBUS. Over on Mix 107.7, the Cooper Bulldogs will face off against Winona in Mt. Pleasant at 7:30. Also playing on Friday night is Chisum against Troup in Sulphur Springs at 7:30. After a 41–13 win over Angelo State on Saturday afternoon, The Texas A&M Commerce football team has qualified for the NCAA Division 2 football championship for the fourth consecutive season. The defending national champions will be the sixth seed in Region four and will play at Minnesota- Duluth this Saturday. The No. 22 Texas A&M Commerce volleyball team earned its second consecutive berth into the NCAA Division 2 tournament. The Lions are the second seed in the South Central Region after earning the Lone Star Conference’s automatic bid with their 3–1 win over Tarleton State in the LSC Tournament Championship Saturday afternoon. 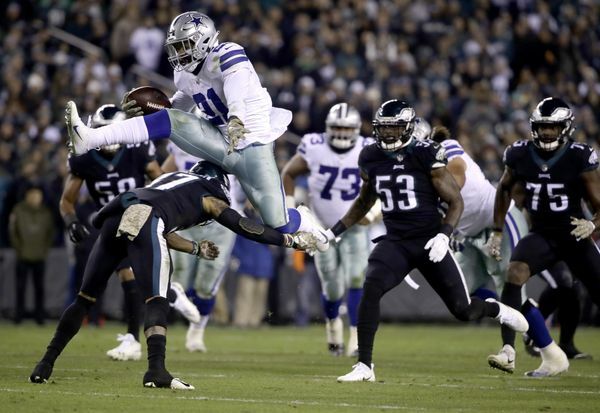 And the Dallas Cowboys had an impressive road victory last night in Philadelphia 27–20. Dak Prescott threw for 275 yards and accounted for two touchdowns. While Zeke Elliott had 151 yards on the ground and also accounted for two scores. Dallas will play Atlanta this Sunday. Pittsburgh Steelers running back Le’Veon Bell is unlikely to report to the team by Tuesday’s deadline, which would make him ineligible to play the rest of this season. Even as the Steelers brace to lose their marquee running back for the entire season, Bell’s camp repeatedly has declined to address with reporters his plans for the coming week. The deadline is Tuesday at 4:00 pm. Things look the same atop the AP College football poll. Alabama, Clemson, Notre Dame, Michigan, and Georgia round out the top five, while Oklahoma, West Virginia, Washington State, Ohio State, and LSU round out the top 10. The CFP poll will be announced Tuesday night on ESPN. Davidson rushed for 789 yards Saturday at San Diego, the most ever by an FCS or FBS team in a single game, but lost. Despite a historically bad day on rush defense, San Diego won 56-52 to clinch the Pioneer Football League championship. In the loss, Davidson had four players rush for at least 150 yards.